I’ve been planning this giveaway for quite a while now, and yesterday I finally had everything I needed. Coincidently, I also reaches an amazing milestone of 250 Bloglovin followers, so I thought it was the perfect time to thank you all with some treats. When I first started writing I never thought so many people would be interested in hearing what I say, so I just want to say how grateful I am to each and every person who reads, comments and shares my blog. It means an awful lot to me. For this giveaway I decided to collect together a range of my favourite things to share with one lucky reader. 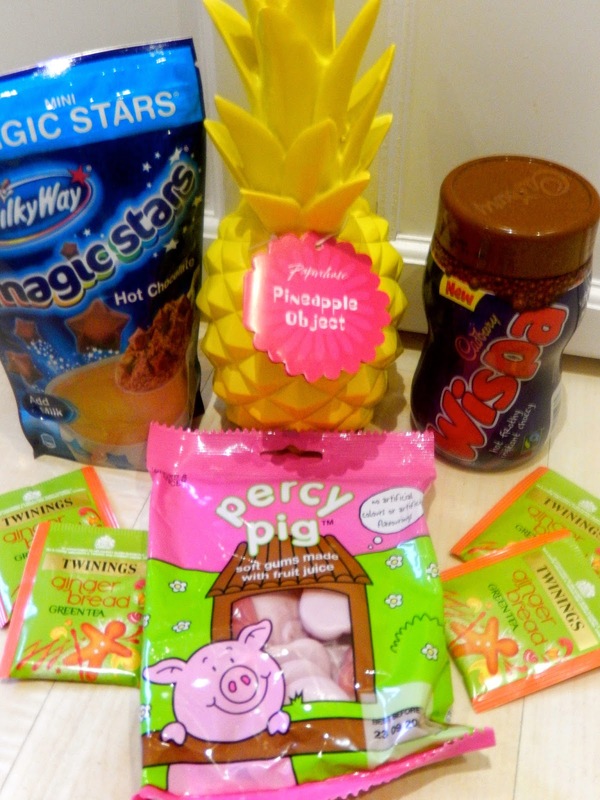 The winner will receive this box of goodies, which include a whole variety of my favourite products including Soap and Glory smellies, a Lush Bubble Bar, Percy Pigs, a favourite Yankee candle, sticky notes that represent one of my favourite holidays to New York and a random yellow pineapple, because who doesn't want a fake pineapple in the summer?! For your chance to win, just fill in the Rafflecopter below – the more you do, the more chances you have at winning! The competition will run for two weeks, ending on Wednesday 18th June 2014. I'm afraid this is UK only, as it would cost me too much to try and post overseas. Hopefully in the future I'll be able to do something for everyone though, as I appreciate you all so much. Thank you again for your loyal readership, and here’s to the next 250 followers! What are you most excited to win in this giveaway? Do you know of any other good giveaways that are currently running? The Percy Pigs, I bloody love em I do. Scuse the language hehe. The Yankee candle! I love them! I may be strange but I really want the pineapple. Then again I'm a fan of the TV show Psych. I would like to try the Lush bubble bar, I hear good things about Lush but have never tried anything. Thanks for your email, I am very pleased to have been picked as your winner there will be something for everyone in the family I think. Thank you. i'm excited about all of soap and glory! Thanks for the giveaway! I'm most excited to win the Lush BB as that one has always been a favourite of mine. The Soap & Glory hand cream - I love the smell! I wish they made giant magic stars, that'd make me so happy! I love how the tag on the pineapple says 'Pineapple Object'! I nominated you for the Liebster Award! Check it out on my blog! Giant Magic Stars would be amazing Jenny! Hehe yes it's a pretty self-explanatory object! Bridget Jones Diary - would love to see this again. I would have to choose the Yankee candle i'm obsessed with them ! The new york sticky notes! I love the look of all the prizes :) But I'm most excited about the Yankee candle, yay! Love the look at the hand food. My hands always need some pampering. I love soap and glory they always smell so lush and they are such a treat! Percy Pigs for my sister, nail polish for me and the yankee candle for my nights in with my OH.